The Black Cat Sketch Comedy group parlays the ridiculousness of the human condition into the tried-and-true form of live stage comedy. Founded in 2015 and run by American Improv Theatre (AIT) performer and instructor Alan Kaatz, the sketch group harnesses the talent of the AIT community to bring smart and original sketch comedy to San Jose, a metropolis relegated to the cultural shadow of San Francisco. By day, the writers and performers of the group toil in the tech capital of the world. By night, they apply their boundless wit and passion into producing unique comedy shows in the SF bay area. From musical numbers to sketches on rogue artificial intelligence, audiences always leave laughing. And maybe worried for the future. 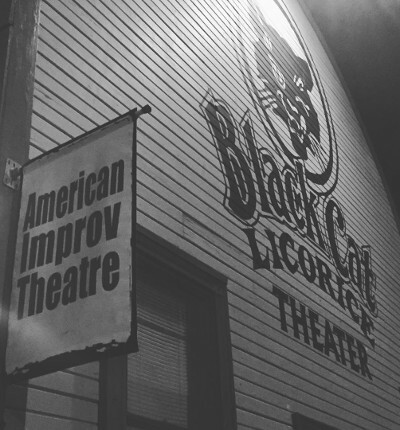 Aptly named after the Black Cat Licorice Theater, Black Cat Comedy's popular and highly anticipated shows periodically complement American Improv Theatre's weekly improv shows. Check back soon for the 2019 schedule.